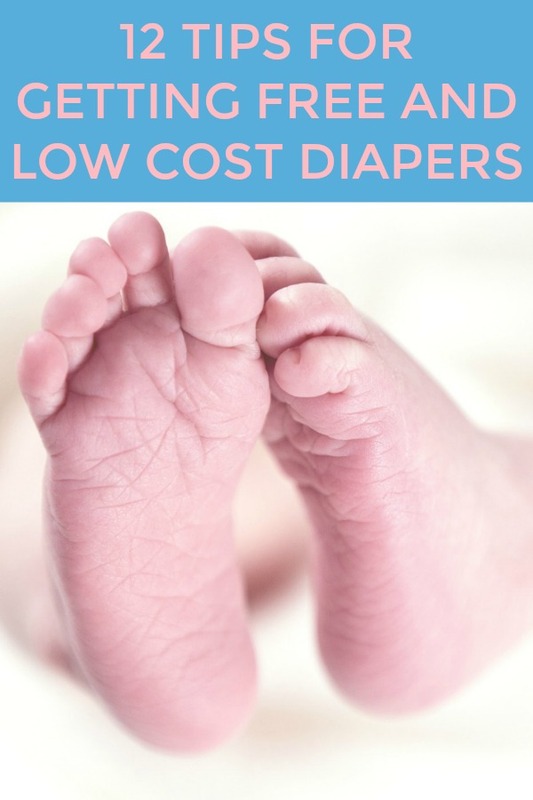 Books, Bargains, Blessings: A Dozen Tip for Getting Low Cost (and even FREE) Diapers! A Dozen Tip for Getting Low Cost (and even FREE) Diapers! Diapers are a huge expense for parents of babies. Is there any way to get inexpensive diapers? What about free diapers? My answer is a RESOUNDING YES. First I would encourage you to start stocking up as soon as you know you are pregnant (or if you are a relative, as soon as you hear the announcement.) Diaper deals are often limited, but starting early and being in the know can help you maximize your savings. 1. Watch for clearance sales. Believe it or not, diapers do go on clearance. Sometimes stores aren't carrying that brand any longer, packaging has changed, or the store might even be going out of business. I once bought 10 packages of various sized diapers for friends as a baby shower gift. They ranged from size 2 - 4, and I paid under $1.50 for each package. Retail would have been nearly $150! 2. Create an Amazon Baby Registry. Be very picky about what you ask for, and put lots of diapers on your list. Don't limit asking just for the size you will need at first. I would recommend putting all 2788 diapers suggested in the list above on your registry as the very first thing. As you buy the different sizes, you can adjust the total needed on your registry! How handy is that to keep track of what sizes you have and what you need? 3. Enter giveaways. The site Change-Diapers.com has a weekly giveaway link up for CLOTH diapers. You can also sometimes find giveaways listed on other blogs for disposable diapers. Be sure and visit all the diaper websites and sign up for everything you can. Coupons, sweepstakes, samples, etc. You can also search twitter for common giveaway terms for diapers. 4. Start your shopping online through eBates.com You will be purchasing a lot of items in the coming months. Start your shopping here and get money back which you can use on diapers -- even better is finding diaper deals through eBates, and getting money back on diapers after you saved money through other purchases! 5. I have seen money back on diapers through Ibotta and Savingstar. These are apps where you take photos of your receipt and receive money back. You could even decide whatever you save from your trips to the grocery store could go towards diapers (they are mainly groceries but sometimes diapers are in there). I just put the money I save back in my household budget, but I have a friend who decides she is going to save all her money and buy a certain item with her savings. She was able to purchase a Nutrabullet with all the savings from these apps, and you could do the same with diapers. 6. Ask people for coupons. Many people, even ones who use coupons, won't use diaper coupons. Some coupons online can only be printed once or twice by someone. Your friends and family might be willing to print some of these for you! Combining this with other deals, such as the nearly weekly Dollar General $5 off $25 purchase coupon from their app can really help in bringing down the price of diapers. 7. Learn how to make the most of combining sales, deals, and coupons at CVS and Walgreens. I have donated a number of diapers to domestic violence shelters, and I haven't paid more than a couple dollars a package for them. Both stores have apps, which you will need to get the most savings possible. The CVS app tailors your coupons to your buying habits. Sometimes you might have rewards from your last shopping trip left over, and there might be a $5 off $25 purchase of diapers in the app. You can combine that with coupons, and if you are lucky, they will have a deal if you purchase $30 of diapers you might get $10 back for your next purchase. 8. If you are able manage your money wisely, sign up for a credit card where you get cash back. A great no annual fee one is the Discover card. You earn cash back on all purchases, and each quarter they change their bonus category where you receive 5% cash back on your purchases in that category up to a combined $1500 spent. Also, make a purchase in the first three months of signing up and you will get a bonus $50. When cashing in your rewards, get a gift card to make it go further. For instance, the $50 CVS gift card in the rewards section is priced at $45. Use it combined with the above shopping advice on CVS to save even further. 9. If you can avoid it, don't be brand loyal. I have friends who when they had a baby told everyone they always used a certain brand of diaper. Upon questioning, I learned it wasn't because of baby's sensitive skin or how absorbent it is -- they just thought it was cheapest. What they missed out on was people giving them left over diapers once their child was potty trained, coupons, telling them about good deals on other brands, etc. 10. Change your search engine. I know this sounds funny, because who would want to leave google? I have found Swagbucks to be just as good, and I have it set up on my browser as my default search engine. I earn enough each month to redeem for a $25 gift certificate of my choice. That equals $300 a year for just changing my search engine. Choose your gift certificate to a place you are finding good diaper deals and make it go even further. 11. When you find a great deal, purchase the maximum quantity allowed as long as you have storage place for all the diapers. Sometimes stores have limits, sometimes the coupons do, or even the quantity on the shelf could keep you from buying as many as you would like. (In the latter case, see if you can get a raincheck -- it could even give you extra time to gather coupons!) The biggest key to savings is buying all that you can get at a low price. If you are just focused on the immediate need, you often pay more. An example of this in my life is cereal. I have heard people say sometimes their pantry is so cluttered they purchase a box of cereal when they already have two in their house. That is not the way I buy cereal at all. I am "low" on cereal right now with only about a half dozen boxes. I need to start watching for sales on it again, but when I can buy it at under $1 a box, I purchase as much as we will use until it goes bad. 12. In the event you have any diapers left over when you no longer need them, donate them to a food pantry, women's shelter, or homeless shelter and take a tax write off -- and you can take the tax write off for the full amount of the diapers, not just what you paid for them. Join my free group, "Baby Deals, Sweepstakes, Giveaways, Bargains, and Freebies" group on Facebook. We are just getting started, but we would love to have you!